Lower noise – Noise produced varies with the Third power or the change in speed. It does not have a linear relationship. Two fans running at 50% together produce 50dBa in comparison to one fan running at 100% producing 60dBa to achieve the same operating point. This significant 10dBa reduction in noise when running two fans simultaneously is 1/8th the noise of lone fan working at full duty. Efficiency – Two Fans running at 50% consume 48Wa combined energy while one fan running at full speed consumes 100Wa. A significant reduction in power usage when using two fans running simultaneously. The efficiency of the unit can only be maintained if fans are all running together at their desired operating points. When a fan fails the other fans must then speed up to pick up the duty. 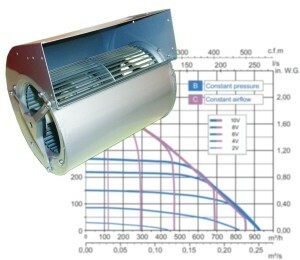 With this in mind we can appreciate the importance of monitoring fan units for fan failures. The Ecofit M41-A5 from Axair has on board failure monitoring, this benefit is an add on for other manufacturers making the unit a cost effective and effective choice when installing this type of application. The most popular option for fan coil monitoring is a taco output, which generally come as standard with most manufacturers EC motor ranges. The problem with using taco monitoring is that multi-fan systems within a plenum arrangement are systems of two halves. The inlet side is under a constant low pressure and the discharge side under constant high pressure. As soon as a fan fails and begins to slow down, the taco pulse also slows until the unit stops and runs in reverse. Taco monitored systems will not show fan failure until either the motors are locked, there is a complaint that the unit has lost performance or there is too much noise as one or more fans run full speed to try and pick up the duty lost when most of the fans are failed, causing an inefficient system and high noise levels. The GDS range of fans from Axair are available in various configurations including taco output, built in monitoring alarm, Constant pressure or constant volume monitoring with no additional bolt ons required. Contact us on 01782 349430 for more information.